The Nvidia 3D Lightboost technology was originally designed for use in 3D monitors together with the company’s 3D Vision technology for stereoscopic 3D gaming with reduced crosstalk and improved level of brightness as compared to the older 3D Vison-ready monitors. Lately however 3D-capable monitors with support for 3D Lightboost technology are also creating a lot of interest among users not playing in stereoscopic 3D mode, but instead using them in 120Hz 2D mode and the reason is not only the higher refresh rates that these monitors support in 2D mode as well, but also due to the fact that you can relatively easy enable the 3D Lightboost technology in 2D mode as well. The advantage of using the 3D Lightboost technology in 2D mode is that the motion blur is being eliminated, making fast movements appear much smoother now as compared to using only 120Hz refresh rate with no 3D Lightboost enabled. What the 3D Lightboost technology does is to strobe the backlight instead of having it always on like on traditional monitors (it is on only when the whole frame is drawn and off between transitions while the next frame is being built), the side effect is that you get a reduction in the maximum brightness you get when 3D Lightboost is enabled. And while the benefit of having motion blur eliminated in 2D mode is definitely a good thing, what bothers some people is the lower brightness you get, so I took an Asus VG278H 3D monitor for a spin and played a bit with the brightness settings to see what you can do to get the most out of it if using it not only for stereo 3D gaming, but also for 120Hz 2D gaming with 3D Lightboost technology enabled as well. Here is how the default color reproduction is with the Asus VG278H out of the box settings, this means 2D mode 120Hz refresh rate, Brightness set to 90 and Contrast set to 80. As you can see the maximum level of brightness the monitor is capable of at these settings is quite high, at over 400 cd/m2 it is very bright, so lowering the brightness from this level can be noticeable, especially if it is not just a slight decrease. Calibrating the display for better color reproduction while trying to maintain the highest possible brightness level does produce very good results and the maximum brightness remains at a high value at 285 cd/m2. Now, you should be aware that over 400 cd/m2 is really an overkill brightness level for monitor that you will be spending hours for gaming, let alone if you also use it for work and other tasks. At 285 cd/m2 the brightness level is more tolerable, but can still be more tiring for the eyes of the person using it, especially for longer periods. 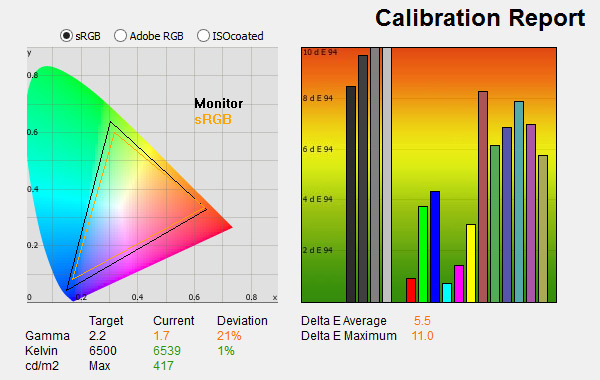 If you’ve read my review of the Asus VG278H 3D monitor for stereoscopic 3D use, than you probably have also seen my recommendation to lower the Contrast level to about 55 from the standard value of 76. This will significantly reduce the level of crosstalk you will be getting in stereo 3D mode as with the default value of 76 for the Contrast the crosstalk you get is annoying. Now, the interesting thing here is to measure what is the actual brightness you get with a setting for Contrast of 55 when you are in stereo 3D mode or in 2D mode with the 3D Lightboost enabled. I’ve got 102 cd/m2 which is a bit too low, really making the image seem much darker than what you get with the out of the box settings of the monitor in 2D mode when not using 3D Lightboost – it is more than four times lower here. So while having the Contrast of the monitor set to 55 does work well in stereo 3D mode, you’ll have to consider increasing it when you are playing in 2D mode with Lightboost enabled. Increasing the Contrast to 76, the default value you have set by default for the Asus VG278H 3D monitor for stereoscopic 3D mode does bring the brightness up to about 151 cd/m2, making it much more comfortable for use in 2D mode with 3D Lightboost enabled (this level of brightness works good for me). And while this brightness is quite Ok, there is a bit more to be desired from the level of brightness, especially if you are used to playing with higher brightness levels. Moving to Contrast value of 90 brings the brightness level to 180 cd/m2 which should be a good choice for people that find 150 cd/m2 still a bit dark, as you can see with a Contrast value of 76 and 90 the colors are not very accurately displayed, but that should not be much of a bother for gaming needs. Doing a color calibration at a Contrast value of 90 however seem to bring the best results for me personally, 156 cd/m2 brightness level (works great for me) and very good color reproduction, though calibrating colors is only needed if you are going to be working with colors and then this monitor is probably not the best choice even though when calibrated it can bring out very good results. Just out of curiosity I also went out to test with a Contrast value of 100, something that is not usually recommended as it pushes everything to the max. This brings up the maximum brightness level up to 192 cd/m2, but the color reproduction suffers more. Not to mention that with a value of 100 for Contrast even calibrating the display you will get worse results with just a slight increase in the level of brightness. But as I’ve said already, doing a color calibration on a monitor that will be used mostly for gaming is not needed anyway. And even though that the Asus VG278H 3D monitor can produce very good results in terms of color reproduction after getting calibrated it remains a gaming monitor using a fast response TN LCD panel and it is targeted at gamers, both 2D and stereo 3D ones. So what is the most important finding in terms of the brightness level you get when you have 3D Lightboost enabled in 2D mode as well? Using the default value of 76 for Contrast should work well for most people, though when playing in stereo 3D mode you might want to get that value lowered to something like 55 for less crosstalk. If Contrast set at 76 is still low in terms of brightness for your taste, then you can bring the value up to about 90 which should be Ok, but you should avoid going all the way up to a value of 100. In the end the level of brightness even with the 3D Lightboost technology enabled isn’t so bad if you bring the Contrast up a bit, it is not going to be as high as the over 400 cd/m2 that you can get without the 3D Lightboost technology in 2D mode, but that is a bit overkill level of brightness anyway and it is not recommended to be used if you value your vision. High Efficiency Video Coding (HEVC) or H.265 is a new video compression standard that is being developed by a Joint Collaborative Team of ISO/IEC MPEG and ITU-T VCEG (JCT-VC) for a while already as the successor of the currently very widely adopted H.264 (AVC) standard. The H.265/HEVC has now entered in its final standardization stage and is probably going to be fully approved as a standard very soon, though it will take a while before it becomes widely available in all kinds of devices as the H.264 already is. The final Draft 10 has been presented a few days ago and had received first stage approval (consent) in the ITU-T Alternative Approval Process, so it can be just a month away from getting approved, and a the same time MPEG also announced that HEVC is entering their Final Draft International Standard (FDIS) status which can take two months to have it approved as an International Standard. And if you are wondering why it is important to have the successor of the H.264 standard approved and getting implemented in both software and hardware sooner than later, then you need to think about things such as 4K HDTVs (the standard supports up to 8K), HFR 3D (HEVC will support higher framerates) and other new technologies and products that are going to have more demands in terms of video resolution and storage/bandwidth requirements. The original idea behind the HEVC is to improve the compression efficiency by a factor of at least two compared to the H.264/AVC compression standard for the same content retaining the same quality and though that goal might not be achieved in all conditions, the results demonstrated from the not yet fully finalized new HEVC compression standard are very promising. Of course the reduction of the bitrate requirements while retaining the same level of quality can only be achieved by increasing the complexity of the algorithms used for the compression and decompression of the video. This means slight increase in the time needed to compress HEVC/H.265 video as compared to H.264, but the decoding process is what will be more performance demanding, especially when going for higher resolutions than 1080p. Of course we are probably going to be getting hardware acceleration for encoding/decoding as well as dedicated hardware made to handle the extra load in devices such as HDTVs. Now, you may be wondering how is H.265/HEVC going to be important for you in regards to stereoscopic 3D video support. Unfortunately the current Draft 10 does not cover stereoscopic 3D support, though such is going to be available via extensions of HEVC in order for it so also fully support stereoscopic 3D as well as multiview video and other more advanced features such as 12-bit video as well as 4:2:2 and 4:4:4 chroma formats, but we may have to wait until January next year for these extensions to become available. That should not worry you as you are not going to see H.265 available everywhere overnight, it is a process that will take a few years and meanwhile H.264 will most likely remain as the standard, the speed of adoption depends a lot on the industry and how soon H.264 will start hitting its limits a lot, so that the adoption of the successor may be speeded up. But for now we are still at least a month or two before the H.265/HEVC gets its final approval. Now you can find a lot of similarities here between the H.264 and the upcoming H.265 standard and that is normal as the new one builds on top of the old one and further improves on some features as well as adds new ones. And similar to how the Multiview Video Coding (MVC) extension of the H.264/AVC standard was added as a means to ensure high-quality and resolution 3D video over a medium such as Blu-ray 3D, the upcoming H.265/HEVC will have a similar extension using the Multiview Video plus Depth (MVD) format. The new MVD format is going to be addressing one of the drawbacks that MVC has and that is to be able to provide multiview data for display on autostereoscopic 3D displays in a standardized way without having to increase that much the bit rate required for encoding the additional views. The 3D HEVC extension has been proposed to MPEG and VCEG and was chosen as the starting point for the development of an HEVC-based 3D video coding standard, but as already mentioned this will take some more time. The idea behind the H.265/HEVC and the 3D HEVC extensions relying on MVD is to ensure that the new video compression standard will be future-proof, so it will not only provide features that we are starting to get the need for at the moment, but also support for features that might be required in a few years from now. By now all of you should be aware of the fact that the newer 3D Vision ready monitors (including 3D displays in gaming laptops) supporting the Lightboost technology are a much better choice for stereoscopic 3D gaming than the older models, but it turns out that going for a Lightboost-enabled 3D monitor can benefit 2D gamers that want to take advantage of the supported 120Hz refresh rate. What the Lightboost technology does is to strobe the backlight instead of having it always on like on traditional monitors, and while this leads a lower overall brightness in 2D mode (actually making it look brighter in stereo 3D mode and with less crosstalk). The strobing of the backlight with Lightboost enabled makes the backlight turn on only when the pixels have reached their final stage in building the new image and the backlight stays off while the pixels transition from one stage to another. As a result all motion blur is being eliminated, making fast movements appear much smoother now. You can see how the image is being shown on the display without Lightboost enabled and with Lightboost on on the slow-motion video above made by Mark Rejhon who has experimented a bit with Lightboost and shared his interesting findings in our forum. If you already have a 3D Vision ready setup and are using Acer HN274H B, ASUS VG728H or BENQ XL2420TX Lightboost-enabled 3D Vision ready monitor with integrated IR emitter, or have ASUS VG248QE, ASUS VG278HE, BENQ XL2420T or BENQ XL2411T along with an external 3D Vision IR emitter you can easily enable Lightboost in 2D mode as well. In fact some of you may have unintentionally seen this happen after exiting a game played in stereo 3D mode with the monitor remaining in 3D mode when back in the desktop (it seems darker than normal). All you have to do is set the Nvidia driver to always have the 3D monitor set in 3D mode from the Stereoscopic 3D panel int he Nvidia Control Center. The only disadvantage of having Lightboost enabled in 2D mode (have the monitor always run in stereo 3D mode) is that the brightness is lower than it is with Lightboost not being enabled, so you may need to increase the contrast more than you need it in stereo 3D mode. And while the lower brightness caused by the backlight not being constantly on due to the Lightboost being active can be considered as a disadvantage, these 3D monitors have way too high brightness in 2D mode anyway, so the reduction isn’t that bad, it actually brings the level of brightness closer to the level that won’t tire your eyes that much over a long periods of use… and you have no motion blur anymore. And if you are not using 3D Vision and only have a 3D Vision-capable display, but no integrated IR emitter or an external one you would have to resort to using and EDID INF override driver to make the Nvidia drivers think that you actually have a compatible 3D monitor with full support for 3D Vision. This actually makes the ASUS VG248QE, ASUS VG278HE, BENQ XL2420T or BENQ XL2411T 120Hz capable monitors a lot more interesting for people that are willing to be able to play games in 120Hz 2D mode and don’t care much about stereoscopic 3D gaming. The reason you need to trick the video drivers you have 3D Vision is that the Lightboost technology has been developed for use in stereoscopic 3D gaming, and though it can also benefit people playing in 2D, probably nobody though about that at the time is has been developed. So without the drivers thinking you have support for 3D Vision (even if you don’t actually have IR emitter) you can still enable Lightboost in 2D mode.